Kunitake (国武) was a student of the famous Shinto sword maker, Horikawa Kunihiro (堀川国廣). Kunitake (国武) lived around the first half of the 17th century and he is said to be the youngest son of Sanjô Yoshinori (三條吉則. He is also known to have been the father of Izumo no Daijô Yoshitake. His works are few. As stated, Kunitake (国武) was one of the many well-known students of Horikawa Kunihiro (堀川国廣). Kunitake (国武) is also known to have had a very close relationship with another of Kunihiro’s (国廣) students Dewa Daijo Kunimichi　(出羽大掾国路). This fact is noted in Tanobe Sensei’s sayagaki. Because the works of Kunitake (国武)　are so rare, little more is known about him. To get a better feeling for this smith, it would be best to study his teacher, Kunihiro (国廣). Kunihiro (国廣) is considered by many to be the foremost master of all Shinto sword makers in terms of both his skill and the large number of excellent students who trained under him. In addition, he was one of the most prolific of smiths having produced swords from Tensho 4 (1576) up until the year before he died in Keicho 19 (1614) at the age of 84. Kunihiro (国廣) demonstrates two different kinds of workmanship. The first is called his “Tensho-uchi” or “Koyu–uchi” which indicates the style of blades made during his Tensho days of wandering. 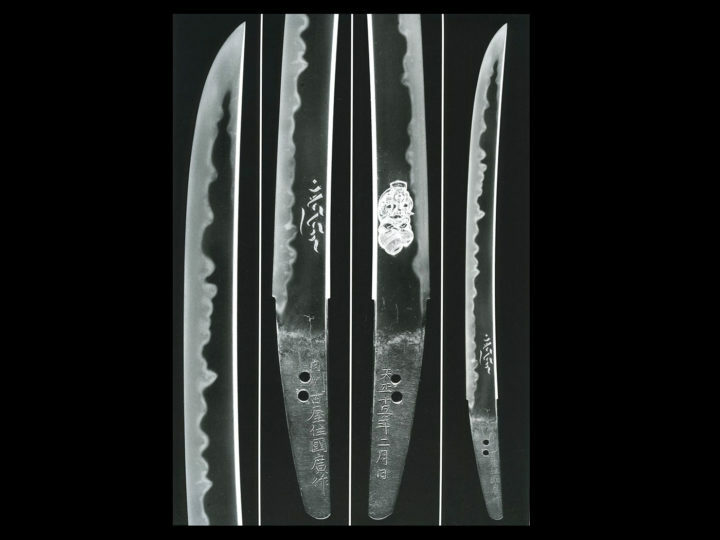 The second is called “Keicho-uchi” or “Horikawa-uchi” which indicates the blades he made after settling down in the Horikawa section of Kyoto. The “Tensho-uchi” swords show definite traits of Sue-Soshu and Sue- Seki influences. The “Keicho-uchi” or “Horikawa-uchi” swords show strong orthodox Soshu traits of such smiths as Masamune, Sadamune, and Shizu Kaneuji. The list of other important smiths who learned from Kunihiro (国廣) is long and impressive. Some of them were, Osumi-no-jo Masahiro (大隅掾正弘), Izumi-no-kami Kunisada (和泉守国貞), Dewa-daijo Kunimichi (出羽大掾国路), Echigo-no-kami Kunitomo (越後守国儔), Yamashiro-no-kami Kunikiyo (山城守国期よ清), and others. 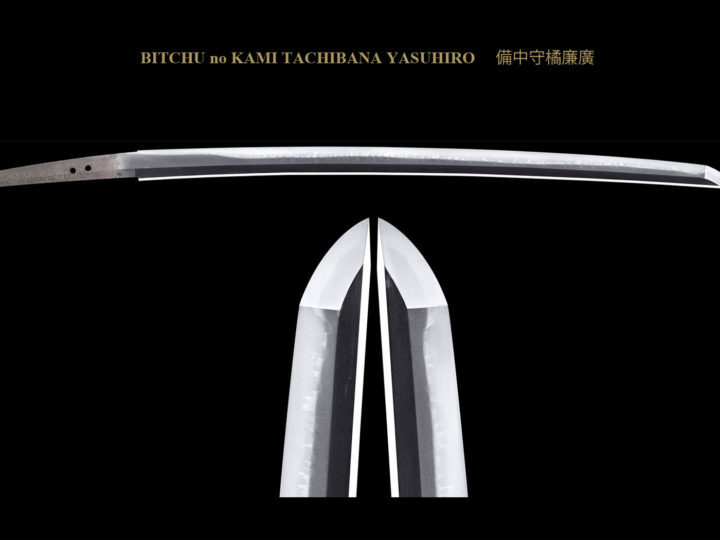 SUGATA: Tachi and katana are usually shinogi zukuri. Additionally, in wakizashi and tanto, hira–zukuri is most common. Iori mune is most frequent. JITETSU: The jigane is of itame hada mixed with mokume hada. There is also often a trace of masame hada in the shinogi–ji. The jitetsu is almost always fairly hadadachi–gokoro showing the grain structure in a rather somewhat loose and coarse impression (zankuri–hada). This is an important kantei point for Kunihiro. 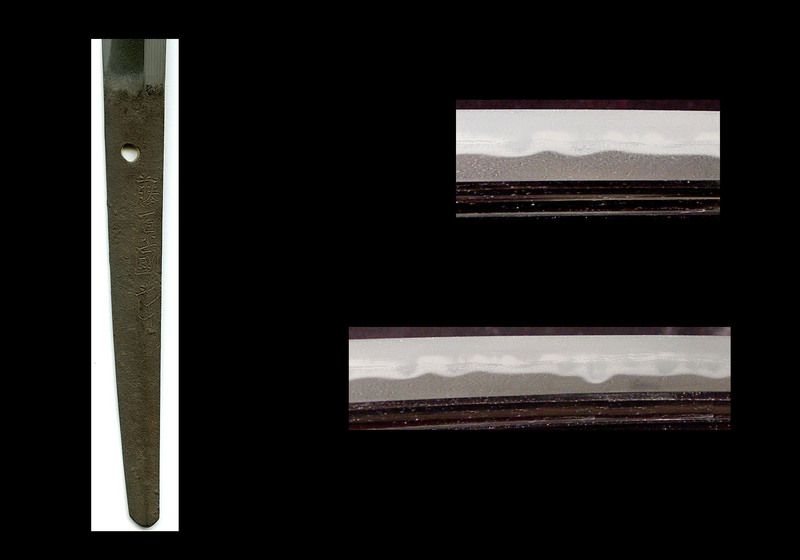 However, there are some examples showing a compact texture sprinkled with fine nie forming a great amount of chikei. HAMON: During the age of the so-called “Horikawa–uchi” period, Kunihiro went through a significant change in his workmanship style. Namely he developed his basic hamon of notare containing gunome consisting of deep nioi admirably sprinkled with ko-nie and embellished with sunagashi and ashi. 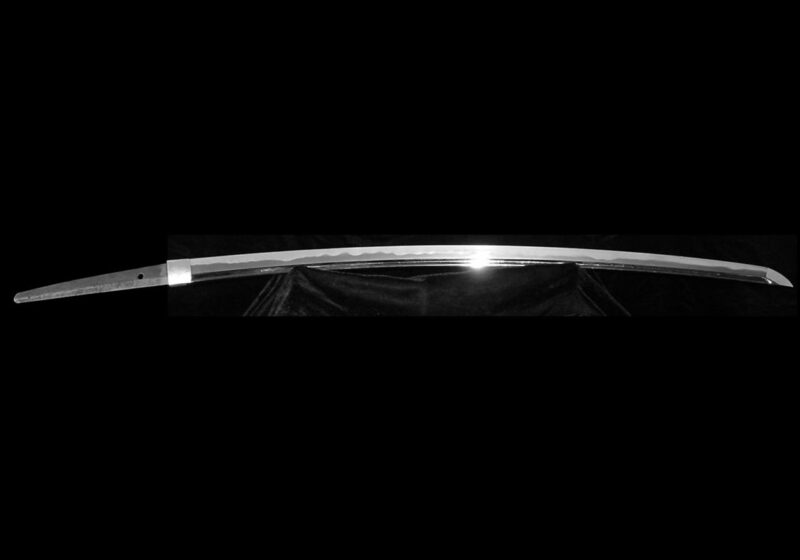 In some blades there are mura–nie along the hamon. One of the characteristics common to all of his works is the inconsistent width of the hamon that suddenly starts widening and increasing in exuberance in the area above the monouchi. 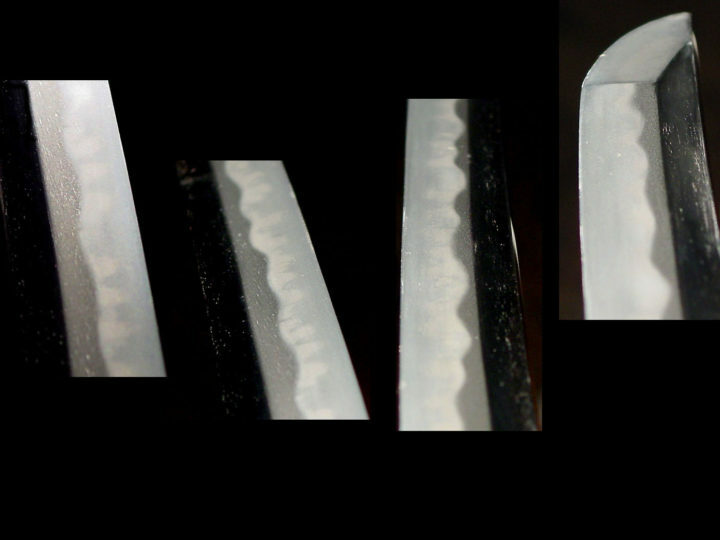 Another important point is the wide tempering executed at the yakidashi where the hamon starts. 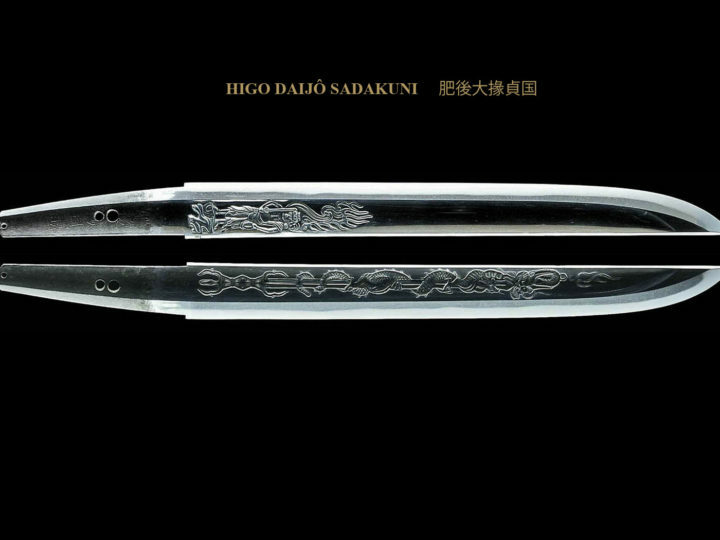 BÔSHI: Concerning swords made at this time, their bôshi are midare–komi with an almost pointed tip embellished with hakkake or rather turbulent, almost deformed midare-komi. Also the kaeri is usually midare and there are some that are extremely yakisage (return going down the mune), becoming almost like mune–yaki. NAKAGO: The most outstanding characteristic of the nakago is its length being longer than most others in general. As for the shape of the nakago, the ha side is thinned down in a shape somewhat like a boat, ending is a kurijiri shape after tapering at the tip. The yasurimei will be ôsujikai.